“Know The Stars And You Will Always Have A Compass”. (Michael Punk. 2002. The Revenant). In article one of this series this article, we briefly touched on the topic of circumpolar stars and here we continue with that discussion. A circumpolar star is one that, from a given latitude on Earth, never rises or sets because it is always above the horizon. Whether or not a star is circumpolar depends on two things, the star’s declination and the observer’s latitude. If the angular distance of a star from the nearest pole is less than the latitude of the observer, then that star will be circumpolar to the observer. (The angular distance of a star is the complement of its declination so if its declination is S57o then its angular distance from the South Pole will be 33o). For example, if an observer’s latitude is 51oN and a star’s declination is N66o then the angular distance of the star will be 24o which is less than the latitude and so it will be circumpolar to the observer. Ursa Major. The best known and easily recognisable constellation in the northern hemisphere is the constellation Ursa Major which is also known by various names such as the Great Bear, the Big Dipper and the Plough. 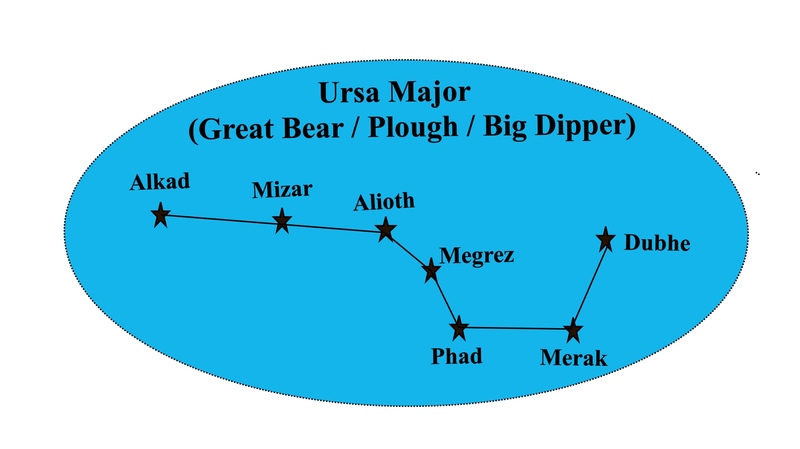 Ursa Major contains 3 navigational stars named Dubhe, Alioth and Alkaid and is circumpolar from about 42o North (the angular distance of Alkaid is 41o). Ursa Minor. The Little Bear (also known as the Little Dipper). Ursa Minor contains the star Polaris which has a declination of 89°16’N. almost coinciding with the Celestial North Pole and for this reason it is also known by various names including Pole Star, North Star, Lodestar and the Guiding Star. Polaris is only the 45th brightest star in the sky; however, it has always played an important role in navigation; not only because it indicates the direction of north but also because it is useful for position fixing in the north polar-regions. Polaris is circumpolar in the Northern Hemisphere from just above the Equator while Kochab, the southernmost star in Ursa Minor which has a declination of N74° is circumpolar from latitudes north of 16°N. Finding the Pole Star. Ursa Major contains a reference line known as the line of pointers. The line joining Merak to Dubhe, when extended will point to Polaris in the constellation Ursa Minor as illustrated in the following diagram. 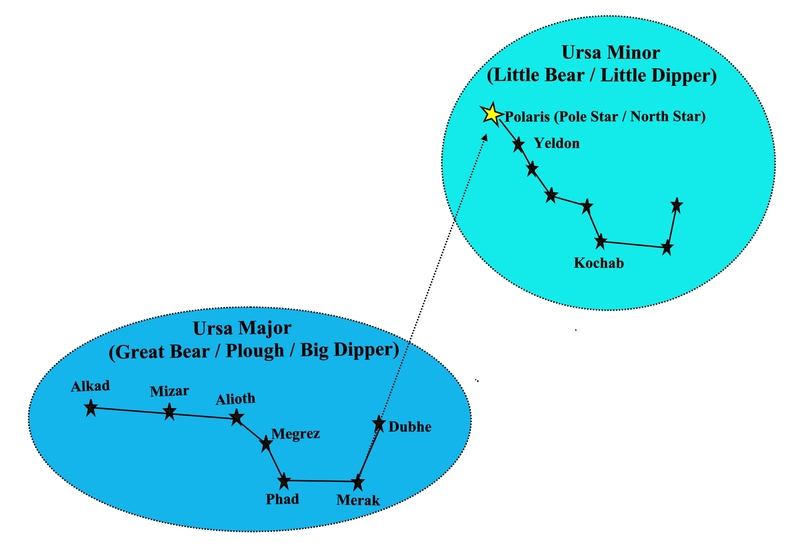 Ursa Major and Ursa Minor are associated with several mythological stories. In one such story, the two nymphs who had nursed Zeus as an infant were sent into the sky by him to form constellations. 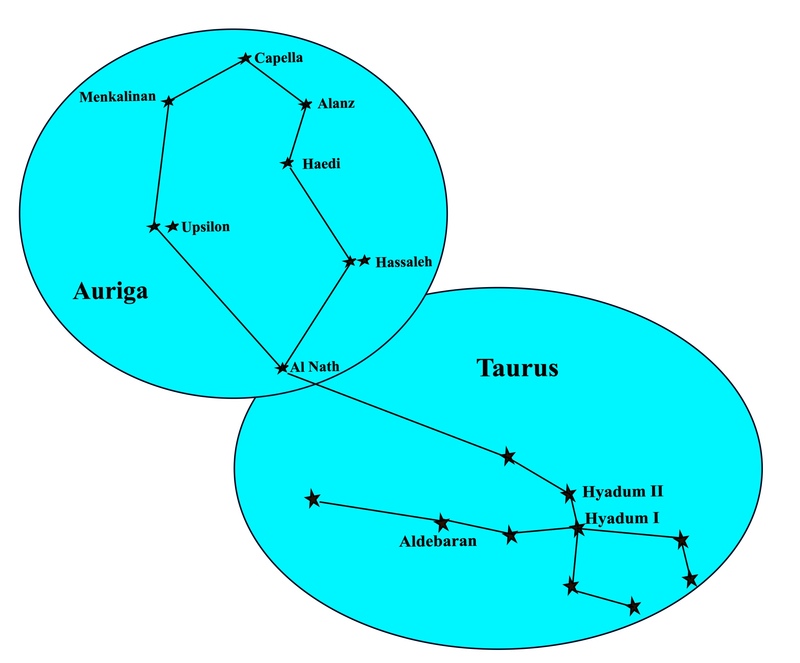 The nymph Adrasteia became the constellation Ursa Major while the other, Ida became Ursa Minor. Cassiopeia. 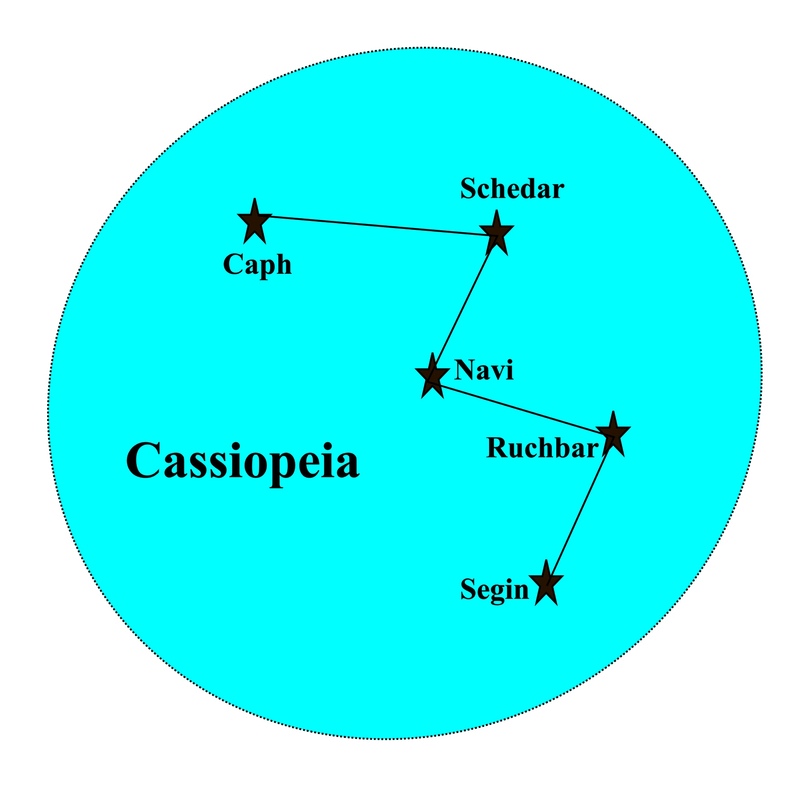 We briefly discussed Cassiopeia in article one; it is quite an easy constellation to find because of its ‘W’ shape which sometimes appears to be hanging upside-down as it revolves around the Pole Star. The brightest star in Cassiopeia is Alpha Cassiopeia otherwise known as Schedir which is a navigational star and is circumpolar above 32°North. How to find Cassiopeia. 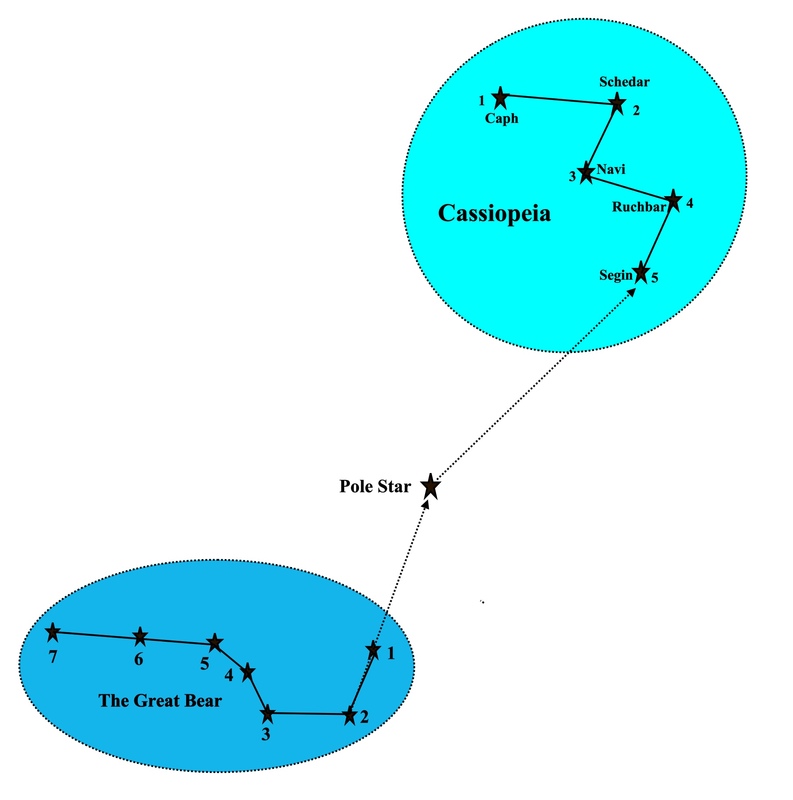 Cassiopeia can be located along a line of reference from the Pole Star at an angle of 135o to the line of pointers in Ursa Major, as the diagram below shows. As Ursa Major revolves around the Pole Star, so do the five stars of Cassiopeia but Segin always keeps its position 135o from the line of pointers. The angular distance of star Segin from the Pole Star is 30o or roughly one and a half hand-spans. 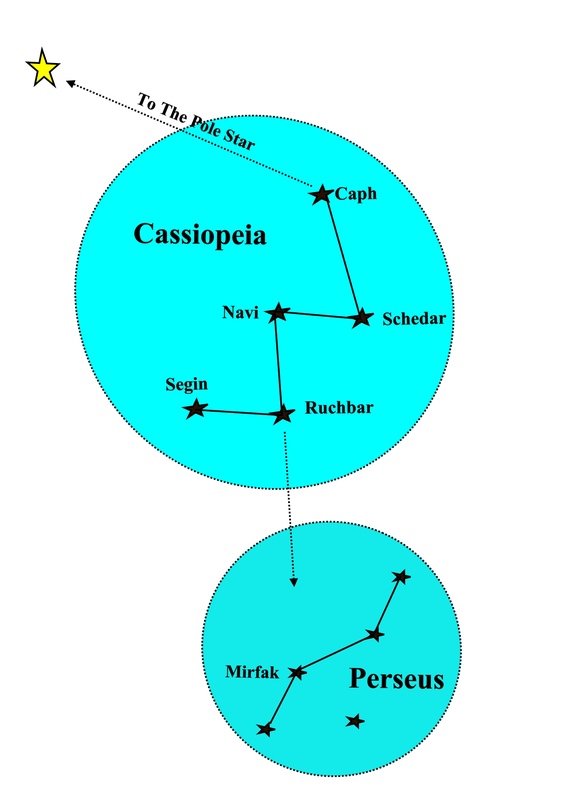 The constellation Cassiopeia is associated with Queen Cassiopeia in Greek mythology. In punishment for her vanity, she was made to sacrifice her daughter Andromeda and as further punishment, she was sent into the sky to circle the North Pole forever. Perseus. 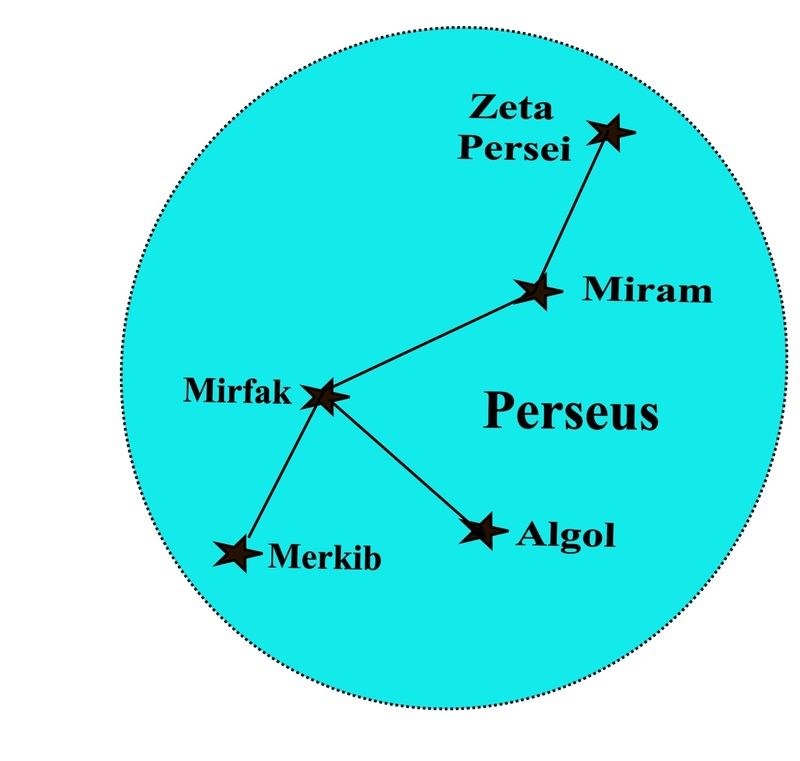 If a line is drawn from Navi to Ruchbah in Cassiopeia, it will point almost directly towards the star Mirfak of the constellation Perseus at about one hand-span as shown in the diagram below. This constellation is associated with the Greek mythological hero Perseus who, on the orders of King Polydectes, slayed the Gorgon Medusa who had the power to turn people to stone. Polydectes had hoped that Perseus would not return and when he did, he became hostile. Perseus was so angered by this that he took out the head of Medusa and turned Polydectes to stone. The wife of Perseus was called Andromeda and the constellation that represents her lies side by side with the one that represents him. Taurus, The Bull. Taurus is a constellation in the northern hemisphere and is visible at latitudes from 90oN to 65oS; for navigators, it is best seen during nautical twilight in January. Aldebaran, which is known as Taurus’ Eye, is the 14th brightest star in the sky and is an important navigational star. The star at the tip of the northern horn of Taurus, Al Nath (sometimes spelled El Nath) is the second brightest star in the constellation and is also a navigational star. In earlier times this star was considered to be shared with the constellation Auriga, forming the right foot of the Charioteer as well as the Northern horn of the bull. Al Nath is circumpolar from 60oN. Finding Taurus. If we imagine a line from Phad to Meral in Ursa Major and extend it for a distance of 80o or roughly 4 hand-spans it will point directly to the star Aldebaran in the constellation Taurus. Once we have located Aldebaran the remaining stars of Taurus can easily be identified. Taurus is associated with several mythological beliefs. In Greek mythology, Zeus was said to have disguised himself as a bull to abduct Europa, the daughter of king Agenor. The ancient Egyptians believed that the constellation represented the sacred bull associated with spring and Babylonian astronomers called it the ‘Heavenly Bull’. Auriga, The Charioteer. In mythology, Auriga is associated with Myrtilus the charioteer because the shape of the constellation was said to resemble a pointed helmet of a charioteer. It is also identified with Hephaestus, the god of the blacksmiths who invented the chariot. 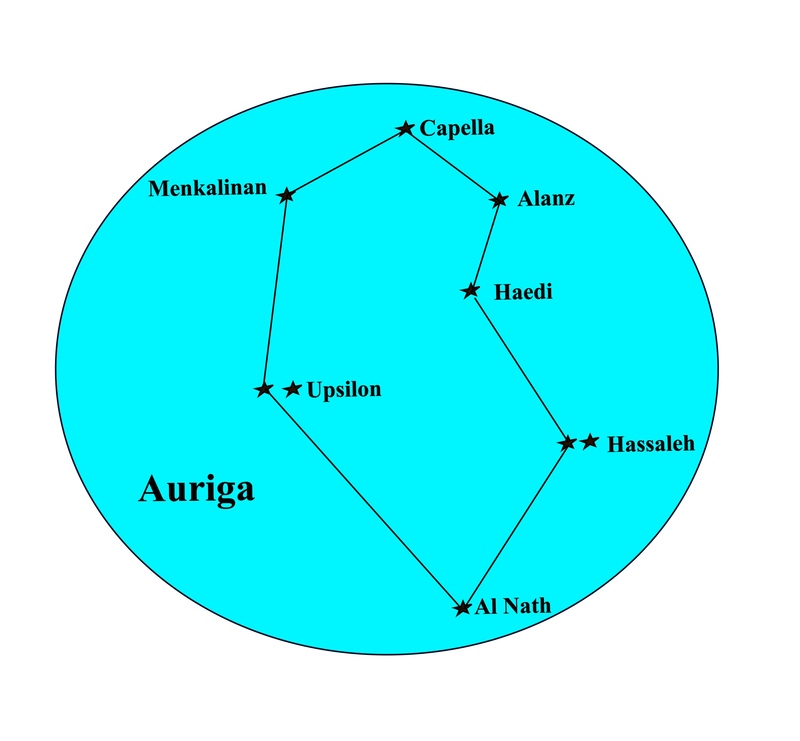 Capella is the brightest star in the constellation Auriga and the 6th brightest in the northern hemisphere. It is circumpolar at latitudes above 45oNorth. The diagram below shows the star Al Nath (sometimes spelled El Nath) forming the right foot of the Charioteer and as has already been explained, it was once considered to be shared with the constellation Taurus where it forms the northern horn of the bull. 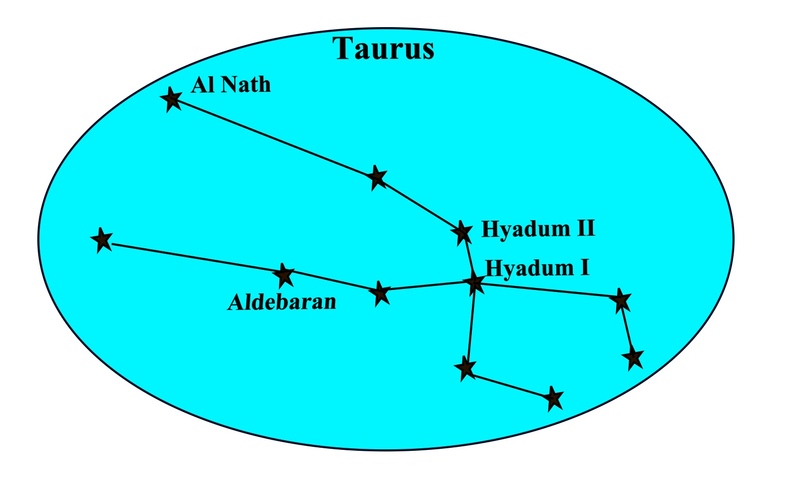 When the constellation boundaries were changed in 1930, Al Nath was assigned solely to Taurus. However, if we still think of Al Nath as the foot of Auriga as well as the northern horn of Taurus, we will have an easy method of finding both Auriga and Taurus as we can see from the diagram below. Watch out for part 4 of this series in which Southern Hemisphere circumpolar stars are discussed. This entry was posted in astro navigation, Astro Navigation Demystified, astronomy, celestial navigation and tagged astro navigation, astronomy, celestial navigation. Bookmark the permalink.